IB courses can seem overwhelming at times. It’s all more than enough to stress you out; everything from the vast amounts of information you get from your high-level classes, to that extended essay that you have no idea where to start with. Even just thinking about external exams after everything else IB requires can be exhausting. In bad exam seasons, teachers sometimes go as far as to assign Theory of Knowledge homework the same week of testing. How can you get it all done? How could you possible stay organized and keep it all straight? Time management and productivity are the key to maintaining high marks in all your IB courses, and continuing on to be a successful student. 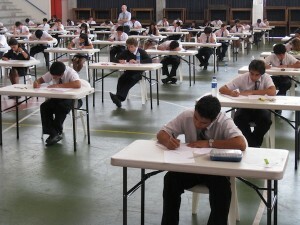 ExamTime is essential to that time management and productivity. There are currently lots of other students who are already using ExamTime for their studies, and they love it! See what some others at Life Hacker, Huffington Post, and Free Technology for Teachers enjoy most about ExamTime. With ExamTime’s study resources, you’ll never feel unprepared. The Study Planner tool is perfect for mapping out your study schedule so you can avoid procrastination, and maximize productivity. Whether you’re planning for the next few days of assignments, or for studying every Thursday night at 7 PM all year, the Study Planner will keep you organized. The Mind Map tool enables you to create a visual representation of how things work together, so that you can keep concepts organized. Whether outlining your extended essay, or forming an overview of a topic you need to study for your IB exams in November, the Mind Map tool is the one to use! Within the Mind Map tool is our Play Mode. This mode allows for a hands-free presentation setting perfect for your TOK class. Simply set your Mind Map up and give it a go! Our Notes tool helps you record absolutely everything your teachers lecture on with ease. You can change note colors and add pictures to enhance your organization and learning. Notes conveniently transfer to any of the other tools ExamTime has to offer. Does quizzing yourself work best? Check out our Quizzes and Flashcards for memorizing those pesky science formulas, remembering dates for history exams, or keeping psychological theories straight. Access IB study notes and resources for free with ExamTime.